1. Participants or those entering the hard copies in the Parish will need to visit vencuentro.org/consultation. 2. Search for your diocese and click the link. If you do not see your diocese listed, then your diocese may not be using an online collection tool. Dioceses are being added so check back soon or ask your Diocesan Chairs. 4. 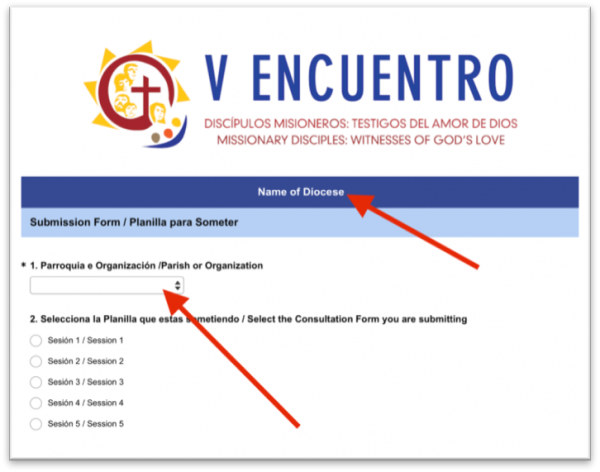 Select the Session Number [For example, “Consultation Form Session 1.”] The number appears at the top of Page in the Journal on pages 35-39 in the Bilingual Version, and the 17-21 in the Spanish Version. 5. Enter the information you answered for each of the question from the consultation form. If you were unable to collect certain information, or if the person did not want to answer, leave it blank. 1. 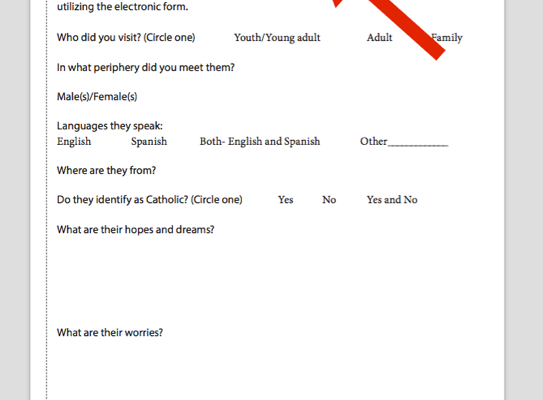 Visit vencuentro.org/consultation to submit hard copies of the Consultation Forms. You will need to submit a form for each participant. If you have 10 participants in your session who completed the consultation form, you submit it 10 times, one for each participant. 10 Participants in Session 1 provided forms: Submit 10 Consultation Forms under Session 1. 9 Participants in Session 2: provided forms: Submit 9 Consultation Forms under Session 2. 10 Participants in Session 3 provided forms: Submit 10 Consultation Forms under Session 3. 8 Participants in Session 4: provided forms: Submit 8 Consultation Forms under Session 4. 9 Participants in Session 5: provided forms: Submit 9 Consultation Forms under Session 5. 5. Enter the information answered for each of the question from the consultation form. When entering answers, type them as they are. Do not change the sentence to help it sound better or correct typos. It is important to hear the voice of the participants so type answers exactly as they are. Even if the answer does not fit the question, submit the answer. 6. Skip any questions that are left blank on hard copies. In your report, these can be reported as unknown.